Tableau Software was forced to sift through thousands of emails documenting problems with their SQL Server data. 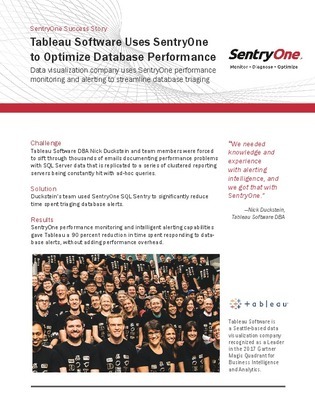 Tableau used SentryOne SQL Sentry to reduce time spent managing database alerts. Read this case study to learn how Tableau achieved a 90% reduction in time spent responding to database alerts without adding performance overhead.